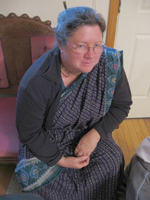 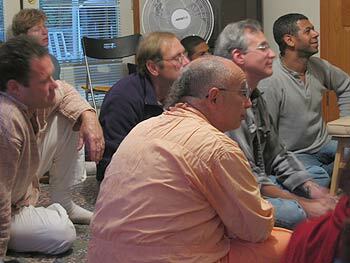 This evening, devotees from Italy arrive, including Krishna Kanta Didi and Munindra Mohan Prabhu. 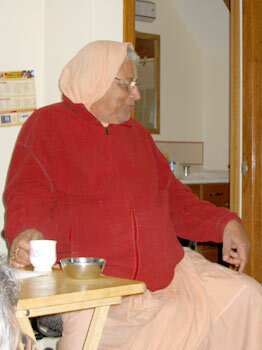 They visit Srila Govinda Maharaj on his veranda. 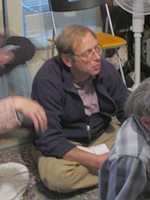 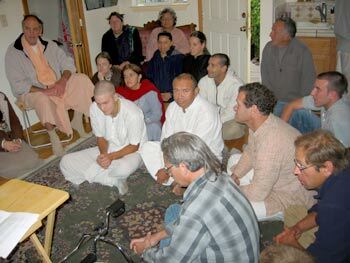 Hasyapriya Prabhu (center foreground), who is one of the pillars at the Soquel Seva Ashram, along with Sripad Siddhanti Maharaj and other devotees. 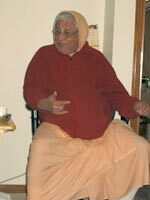 Srila Gurudev seems very happy to hear from Krishna Kanta Didi and Munindra Mohan Prabhu about the Villa Govinda Ashram in Italy. 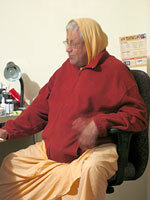 Srila Govinda Maharaj speaks about managerial topics. 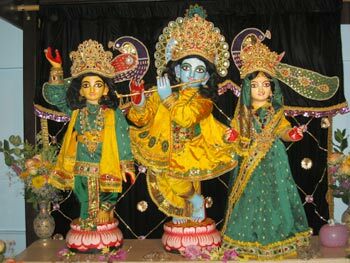 Jivana Didi joins the family gathering. 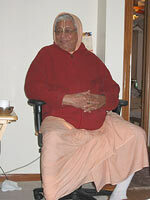 At first she sits in the back, but Srila Gurudev invites her to take a seat in the front. 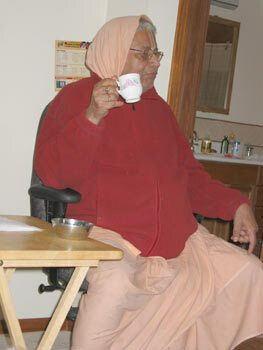 Other devotees are also present (from top): Swarnangii Didi, Diksavati Didi, Revati Didi, and Amiya Kanti Didi. 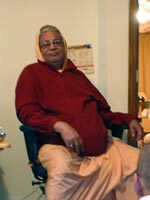 Srila Govinda Maharaj's cleverness enlivens the devotees. 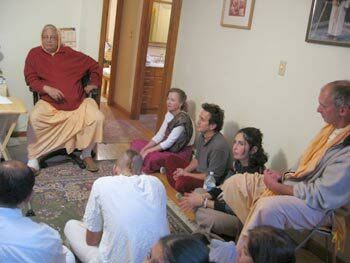 (From left) Jagadananda Prabhu, Braja Mohini Didi, Jayanta Krishna Prabhu, Saki Caran Prabhu, Sripad Janardan Maharaj, Hasyapriya Prabhu and Hari Kirtan Prabhu. 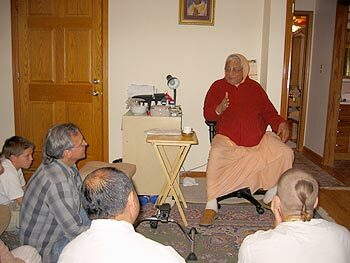 Jayanta Krishna Prabhu (left), Swarnangii Didi (center), Aravinda Locan Prabhu (from outside). 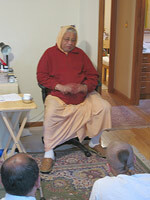 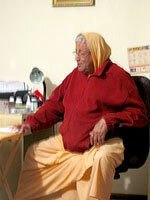 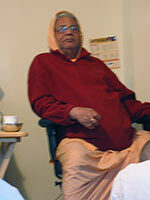 From time to time, Srila Govinda Maharaj appears to fall into a meditative state. 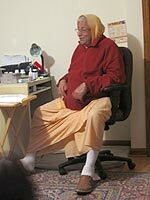 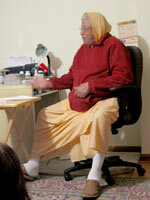 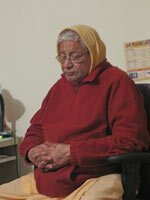 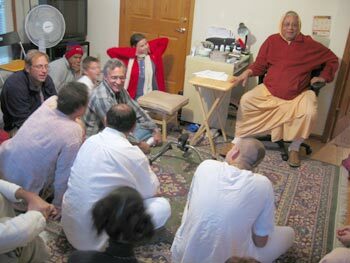 He often says, "I am always thinking about Guru Maharaj's mission." 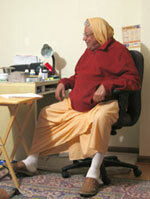 The other night he was eagerly waiting for pictures from India that showed construction progress there.